The Orchestra premiered their score for Go West on August 23, 2015 at SFJAZZ, San Francisco. The score was written by Richard Marriott, Sheldon Brown, and Beth Custer. For this night of 1920s cinema, the Bay Area masters of live silent film accompaniment perform a program reminiscent of classic movie matinees, with the world premiere of their score for the Marx Bros. comedy Go West preceded by a series of animated shorts. Released in 1925, Go West is widely regarded as one of Buster Keaton’s great masterpiece, combining his signature physical comedy and breathtaking stunts with innovative special effects, culminating with the incredible sight of a cattle drive through the streets of Los Angeles. The performance opens with the 1920 Felix the Cat cartoon Felix Woos Whoopie as well as Winsor McCay’s early short How a Mosquito Operates (1912) and Max Fleischer’s Koko the Convict (1926). 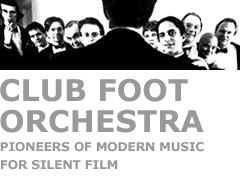 Founded in 1983 by trombonist and composer Richard Marriott and named for the Bayview district performance art club where they got their start, Club Foot Orchestra has performed original scores for many of the greatest silent films in cinema history, including The Cabinet of Dr. Caligari, Nosferatu, Metropolis, Pandora’s Box, and The Hands of Orlac. Their performances have taken them to venues around the world and renowned cultural institutions including Lincoln Center and the Smithsonian.